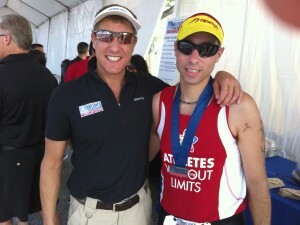 Nations Tri Promotor Chuck Brodsky congratulates Sean for completing his first major Olympic Distance Triathlon. 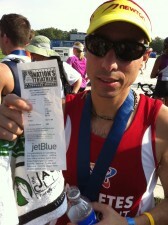 Sean raced the Men’s 25-29 Open category and finished well within the top half of the division. 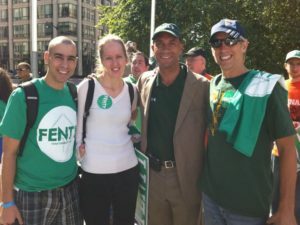 Sean, his wife Pavla and AWL Co-founder Barry Holman talk race strategy DC Mayor and fellow triathlete Adrian Fenty. When Athletes Without Limits co-founders Julie & Barry Holman first met Sean O’Rourke it was at a Disability Cross-Country event near their hometown in Long Island. O’Rourke soon added swimming and cycling to his workout mix and competed in small local triathlon. He then set his sights on Nations Triathlon, an epic Olympic distance triathlon at the National Mall in the heart of Washington DC. The Holman’s, DC Residents and triathletes themselves, hosted Sean and his wife Pavla throughout the event week which featured a meet and greet with both Nation’s Triathlon Founder and CEO Chuck Brodsky and DC Mayor Adrian Fenty, a competitive triathlete himself who also raced that weekend. O’Rourke, who has intellectual impairment related to ingesting lead paint as an infant, competed in men’s open 30-34 age group, with an impressive time of 2:52:17 placing him well within the top half of the nearly 4500 finishers and in the top half of his age group. Watch for updates as Sean sets his sights on being the first athlete with intellectual impairment to compete in a Half-Ironman event!